On a recent hike, I endured what was a sharp reminder of the Sun’s might. I stood at the treeline, surrounded by a rocky, lunar-like landscape and thought, ‘I should have put on sunscreen’. But I quickly shrugged it off – I needed to focus on the new terrain and challenges of navigating. It wasn’t until that evening, sharing a post-hike pizza with my fellow hikers, that the thought returned to me as I caught a glimpse of my face in the mirror: tomato-sauce red. I should have put on that sunscreen! This encounter got me reflecting on the Sun’s power. The Sun is an ever-present being in our lives. It’s the beacon of the day whose rays we crave after weeks and weeks of living beneath cloudy curtains. The Sun showers the Earth with immense energy at every moment. Plants, algae, and bacteria soak up this energy and use it to power their lives. So the question remains, why don’t we? Why do we not harness the Sun’s power to meet the world’s current energy demands and bring energy to the approximately 1.1 billion people worldwide who don’t have sufficient access? To see if this is possible, let’s start by looking at how much energy the Sun provides to the UK. If we had perfectly engineered solar panels that could convert all the light that strikes onto them into electricity, could we generate all the electricity required in the UK? If we account for light scattered and absorbed in the atmosphere, the average amount of sunlight reaching the Earth is about 175 Watts per square metre. Let’s optimistically assume that the UK gets an average of 4.5 hours of sunlight per day, 365 days a year. Then the amount of solar energy striking just 300 square kilometres of land in the UK is roughly equal to the total amount of electricity generated in 2017. Although 300 square kilometres may seem like a huge amount of land, in reality, it is not. It is just about the size of Birmingham! The total land area of the UK is about 240,000 square kilometres. Of that, about 6.8% is urban, and 78% of that urban land is devoted to green-space, such as parks, pitches and lawns. So only around 1.5% of the total land in the UK is ‘built’ on, which is roughly 36,000 square kilometres. If we put effective solar panels on 0.8% on the roofs of the UK—approximately 300 square kilometres—then we could generate all the electricity needed to power the UK! The solar spectrum: wavelength (energy or colour of light) is along the horizontal axis, and the intensity (amount of light) is along vertical axis. 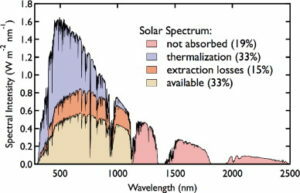 The different coloured shading in the graph illustrate what energy is useable (33%) and what is lost. Unfortunately, it is impossible to produce solar panels that are 100% efficient. 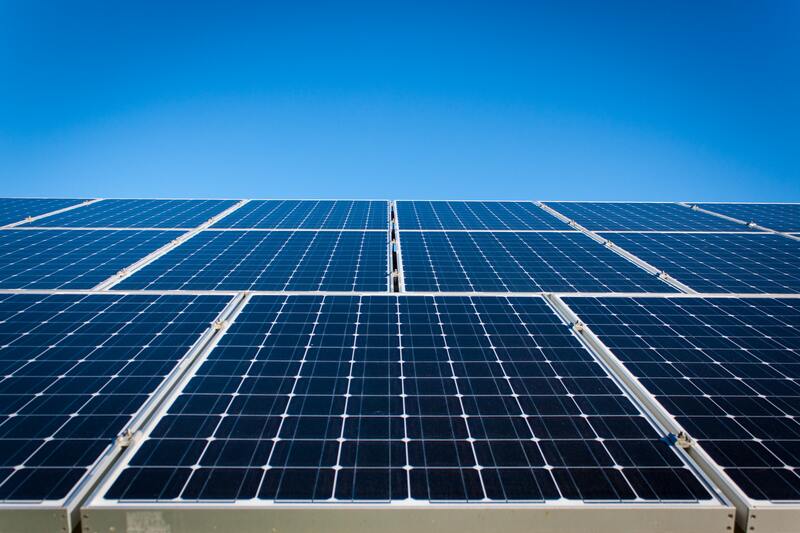 The most common solar panels today are made of silicon. Although their efficiency continues to improve, they will never convert more than 33% of the Sun’s energy into electricity as I show in the adjacent image. To understand why this is, we need to return to thinking about the Sun, and how solar panels work. In actuality, sunlight is made up of millions of particles of light called photons, each of which possesses a certain amount of energy (or wavelength) that determines the colour of light. Together, all the photons of all different energies, hence different colours, form a spectrum. Some of these colours we can see, and some, like the ultraviolet light that caused my sunburn, we cannot. Silicon solar panels are comprised of semiconductors, which means they conduct electricity some of the time. In their normal state, what scientists call their ‘ground state’, all the electrons in the system are bound to atoms. However, if you give electrons in a semiconductor enough energy, then they will flow, or conduct, and generate electric current. The tricky part is that specific amount of energy—often called the bandgap—is one of the things that determines how much power a solar panel will produce. If a photon has less energy than the bandgap, it will pass straight through the solar panel without being absorbed. This is like sunlight passing through a glass window. If the colour of the light striking it is too high in energy, then that excess energy is lost as heat. The electrons bounce against each other like billiard balls until they are at the same energy as the bandgap. Let’s look back at the solar spectrum and its rainbow of visible and invisible light. Some of the light has too little energy to be used in the solar cell, and some of it has too much energy so the excess turns into heat. These two factors account for around 50% off the loss in efficiency in silicon solar cells. While the Sun is constantly striking the earth with tons of energy—we cannot convert all of that energy into electricity. So: how can we improve solar energy generation? That is a tale that I will begin to tell next time! Hope is a student, a runner, and an activist. She is currently pursuing a PhD in physics at the University of Cambridge, where her research focuses on 2D materials for solar energy. Hope grew up in St. Louis, USA and completed her undergraduate degree at the University of Chicago, majoring in physics and minoring in human rights. 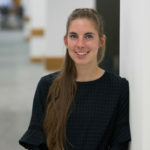 She sought to further pursue both of these fields, and with the support of the Marshall Scholarship, completed an Msc in Science and Technology studies at the University of Edinburgh. Outside of the lab, Hope runs a lot, and pursues ways to make science more just, both for the people who do science and for the people whom science impacts. Enjoy your visit with your folks.